The aim of the present review is to assess the diagnostic performance of PET/CT and PET/MRI in breast cancer patients, by a head-to-head comparison. Two reviewers conducted the literature search, study inclusion and data extraction in duplicate. A literature search for studies on a head-to-head comparison between PET/CT and PET/MRI in breast cancer patients was carried out. MEDLINE databases, such as PubMed and Scopus were consulted using the following keywords: “PET/CT” AND “PET/MRI” AND “breast cancer”. Data about the diagnostic accuracy was collected, if available, in terms of sensitivity, specificity and accuracy. Between 2014 and 2018, 8 articles were available about the head-to-head comparison between PET/CT and PET/MRI in breast cancer patients. PET/CT has a lower sensitivity for the detection of contralateral breast cancer and bone metastasis as compared to PET/MRI. PET/MRI and PET/CT has a similar diagnostic accuracy for the detection of axillary, internal mammary and mediastinal lymph node involvement. Semiquantitative parameters by PET/MRI are higher than those computed by PET/CT, but a strong organ-specific correlation between them was found. PET/MRI has some advantages in breast cancer, being able to detect more primary and skeletal/non-skeletal distant metastases, as compared to PET/CT, thanks to the advantages from the combined MRI. The online version of this article ( https://doi.org/10.1007/s40336-019-00319-2) contains supplementary material, which is available to authorized users. 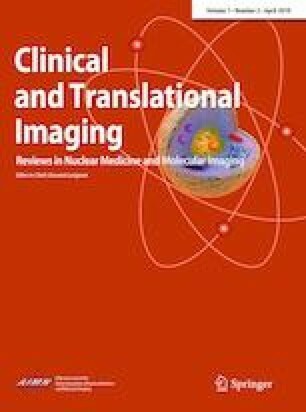 The authors are thankful to the Department of Nuclear Medicine, IRCCS San Raffaele Scientific Institute, Milan, Italy for providing representative images of PET/CT and PET/MRI in breast cancer.